Plume response modeling simulates how groundwater contaminant plumes respond to contaminant source control. Understanding the plume response is important because plumes may grow, stabilize, or shrink depending on the source strength and history, and the plume attenuation mechanisms. Plume response modeling can be used to help evaluate source and plume remediation strategies. Plume models simulate advection, dispersion, retardation, and reactions of contaminants as they migrate downgradient from the source zone. As source zones undergo remediation or natural attenuation, the contaminant loading to the plumes decreases with time. The decreased loading may or may not result in stabilization or shrinkage of the plume, which is also affected by the plume remediation including natural attenuation. Modeling plume response to remediation, therefore, must consider the nature and timing of both the source and the plume remediation. Ideally, this would be done in a single model, but it is usually done by combining source zone and plume response models. Here, we discuss the plume response models. The REMChlor model employs an analytical mass balance source function that accounts for partial or complete source remediation at any time. A time-dependent source model is coupled to the plume model (Fig. 1). Figure 1. Schematic diagram of the REMChlor analytical plume response model. REMChlor allows for spatially and temporally variable contaminant decay rates in the plume. These decay rates can be user manipulated to simulate plume remediation activities or natural attenuation. Figure 2 shows an example of a plume remediation scheme that could be simulated in REMChlor. Figure 2. 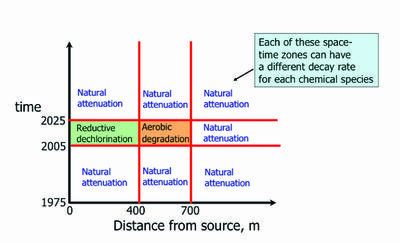 Example “time and space” plume remediation scheme for chlorinated solvents in the REMChlor model that enhances reductive dechlorination from 2005 to 2025 between 0 and 400 m and enhances aerobic degradation from 400 to 700 m (from Falta (2008)). Plume response to remediation depends on characteristics of both the source and the plume behavior. Some plumes may persist long after source remediation, while others may attenuate without any source or plume remediation. The following REMChlor modeling example, illustrates one type of plume behavior than can occur with a persistent dense non-aqueous phase liquids (DNAPL) source (from Falta and Kueper (2014)). In this example, it is assumed that 200 kg of 1,2-DCA was released into a aquifer in 1980. The groundwater pore velocity (sometimes called groundwater seepage velocity; the Darcy velocity divided by porosity) is 60 m/yr, the starting source concentration, C0 in equation 1 is 1 mg/L, the retardation factor is 2, and the natural attenuation decay rate in the plume corresponds to a half-life of 2 years. The time-dependent source concentration is assumed to be a linear function of the source mass. 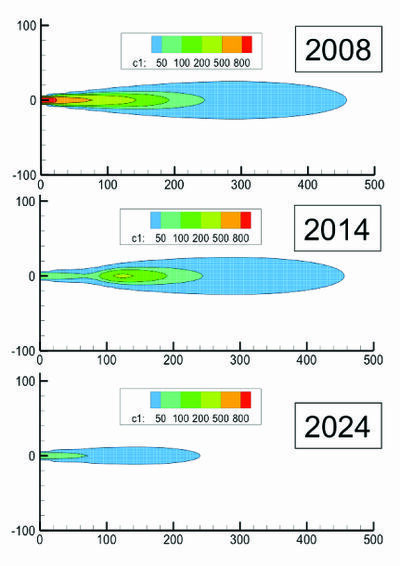 The top panel in Figure 3 shows the dissolved 1,2-DCA plume in 2008, 28 years after the initial release. Enhanced plume remediation was simulated between 2010 and 2020 by increasing the 1,2-DCA decay rate over the first 300 m to correspond to a half-life of 0.5 year. This remediation has the effect of greatly shrinking the plume (2020 panel, Fig. 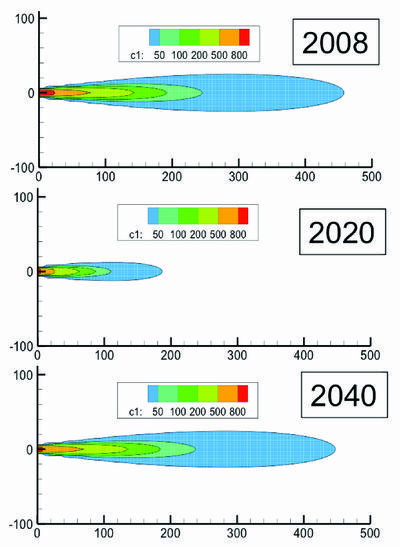 3), but the plume almost completely rebounds after the plume treatment ends (2040 panel, Fig. 3). The plume rebound in this case was due to the fact that the 1,2-DCA source strength remains high due to the low rate of source depletion in this scenario. Source remediation was modeled by removing 90% of the source mass that remained in 2010 (Fig. 4). The source remediation causes part of the plume to become isolated from the source due to the reduced source strength (2014 panel, Fig. 4). Eventually, the effect of source remediation is felt throughout the plume, and the plume stabilizes to a much smaller size (2024 panel, Fig. 4). The plume in this example does not completely go away because it was assumed that the source remediation effort was not perfect, leaving behind 10% of the mass in the source zone. Figure 3. Simulated 1,2-DCA plume following a release in 1980. Plume remediation occurred between 2010 and 2020 (reproduced with permission from ©2014 Springer), and then the plume rebounded because the source was not remediated. Units are ug/L. Figure 4. Simulated 1,2-DCA plume following a release in 1980. Source remediation occurred between 2010 and 2020 (reproduced with permission from ©2014 Springer). Numerical plume models may be used with either a numerical or an analytical source zone model. The coupling of a numerical flow and transport model with a numerical source zone model is fairly complex, and has been done mainly in a research setting (e.g., ). More typically, numerical plume models are run in one of two ways: 1) a constant source term is assumed where concentration does not change over time; or 2) the a simpler analytical source model is run outside of the numerical model and source concentration vs. time data over many years are then entered into the numerical model to simulate source attenuation. One new modeling tool is the MODFLOW-USG groundwater flow model, where USG stands for “unstructured grids”. Unstructured grids allow for inclusion of various cell geometries and grid-nesting methodologies to provide finer resolution of complex stratigraphy and other hydrologic features. This model is emerging as the standard for modeling groundwater flow, and can be used with the MODPATH Version 7 to simulate groundwater plumes using particle tracking. A solute transport model, USG-Transport, is currently being beta tested on the Groundwater Vistas platform in 2016. The parallel fracture models consider advection, dispersion, retardation, and decay in the fracture, with diffusion, retardation, and decay in the matrix. The two-layer model by Sale et al. (2008) considers advection, dispersion, retardation and decay in the aquifer with diffusion, retardation, and decay in an underlying aquitard. Finally, the Sale et al. (2008) and Seyedabbasi et al. (2012) models are included in the ESTCP Matrix Diffusion Toolkit. An enhanced version of the REMChlor model with a matrix diffusion term in the plume (it can already represent matrix diffusion in the source using the gamma source term) called REMChlor-MD is expected to be publically available in 2017. 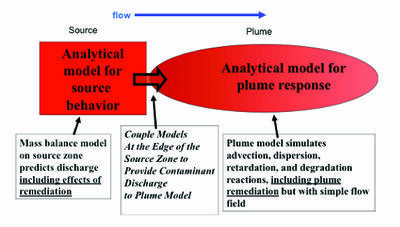 Plume response to source remediation can be simulated using analytical or numerical approaches. Analytical models are easy to set up and run, but they assume simplified flow conditions that may not be realistic at some sites. These models are most appropriate for screening-level calculations and for simple sites. Numerical models take more effort to set up and run, but they have the flexibility to simulate complicated flow fields, and transient flow effects such as groundwater pumping. However, most numerical models do not simulate source attenuation directly and other models are needed to simulate plume response to changes in the source over time. Matrix diffusion may play a significant role at some sites, and newer analytical and numerical approaches are available for simulating this mechanism in plume response modeling. ^ McDonald, M.G. and Harbaugh, A.W., 1988. A modular three-dimensional finite-difference ground-water flow model. U.S. Geological Survey, Techniques of Water-Resources Investigations, Book 6, Modeling Techniques. ^ Widdowson, M.A., Waddill, D.W. and Ruiz, C.E., 1997. SEAM3D: A numerical model for three-dimensional solute transport and sequential electron acceptor-based bioremediation in groundwater. In Groundwater: An Endangered Resource, pgs. 83-88. ASCE. ^ DHI-WASY, 2012. FEFLOW 6.1 Finite element subsurface flow and transport simulation system user manual.